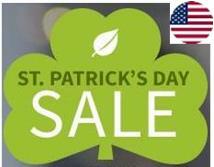 Researchers in the USA can take advantage of a St Patrick's Day discount from AncestryDNA. If you order a DNA testing kit before close of Monday 19 March, you'll make a saving of US$30 on the standard price of US$99. The offer price of US$69 excludes taxes and shipping. To place your order, click the image.